We’re all caught up on Mr. Sunshine after missing it yesterday. I expect a lot more tears in the coming episodes. Just as a heads up, our weekday live recaps will start at 9am CTS everyday from now on regardless of when the shows air due to our commitments this fall. But the weekend live recaps will be live as the show airs (you know as usual). We will not pick up another show until September (when like ten or eleven shows premier). Check our sidebar to see what those shows are, when their scheduled premier dates are, and links to more info. The shows we are eyeing are: Fox Bride Star, 100 Days My Prince, The Beauty Inside, Bad Papa, Terius Behind Me, The Smile Has Left Your Eyes, The Guest, The Player, and The Third Charm. We won’t recap all those shows, but we will most likely pick our next group of live recaps from this list. 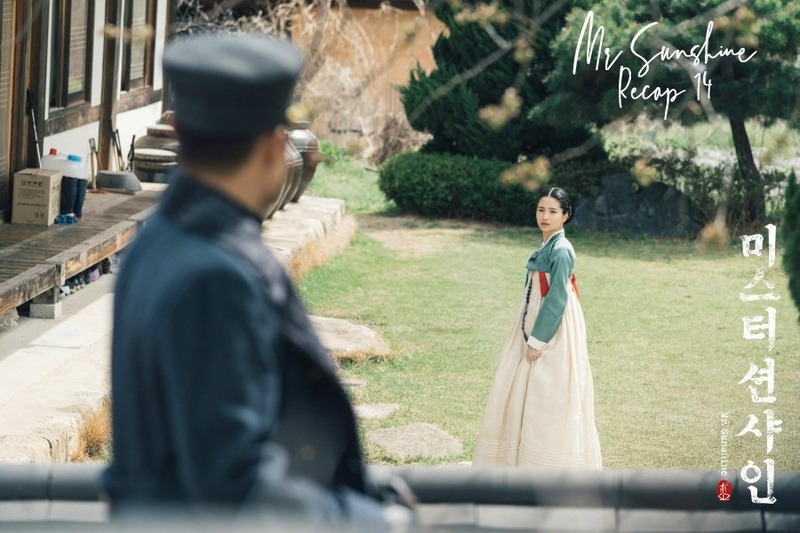 We are looking very favorably at The Third Charm, 100 Days My Prince, and Terius Behind Me! Aeshin opens her palanquin and tells her walkers to stop. She sees Eugene crying over Joseph’s body. But her maid will not let her get out and instead tells her that she should be nowhere near this. Even if you kill me, I will not let you get out. Eugene continues crying over Joseph. VO – I miss you Eugene, you great and gracious man, my son, Wherever you are I will pray for you. The night I don’t pray, I hope God will be with you. – Joseph. Eugene keeps crying as Kyle shows up. Kyle tells the soldiers to take care of the body and move if respectfully to the hospital. Aeshin is beside herself with worry and waits at the pharmacy for news. Her people tell her that an American missionary died, but it does not look like an accident, it seems like he was shot. Aeshin thinks back to what Eugene told her about the missionary that saved his life. Cut to Dongmae. He is in his dojo and gets news from his #1 that an American died. DM asks if it is a black-haired American. His #1 tells him it is a blond haired blue eyed American. Dongmae says to check their own kids to see if anyone made any trouble. Kyle and GS look through clues to see what happened with Joseph. Eugene is there as well at his desk, but he is not talking. GS recognizes one of the letters and talks about it. This sparks a memory from Eugene about this letter. GS explains that the assassination is related to the dead. They wonder which one will come first. Either kill Eugene first or kill the missionary? Or approach Eugene through the missionary? Another soldier comes in and tells them that Kim Young-joo tried to kill EC and got out of jail 4 days ago and disappeared. Kyle says that was one day before the missionary. Lee Dong-woon meets with WI and talks about the emperor’s bloody letter with him. WI thinks he should threaten the emperor with it. Dongwoon wonders if this letter is fake or not, but WI swats his hand away. Meanwhile, Eugene goes to the Japanese consulate and has his soldiers search it for Kim Young-joo. Wi and Dongwoon approach him and tells him that he can’t just search everywhere. WI tells him that half the bad things that happen in Joseon are because he did it, but now, one asks him about it. Before he went to Japan, 5 people wanted to kill me, but I killed them first. Eugene calls him a son of a b, but he tells him sorry, I am American so I just say what I think. You should think about this, I am American, and you are on my suspect list. I will charge you. WI wonders if he is making Japan his enemy? Elsewhere, DM is approached by another Japanese person. One of his Japanese thugs is killed by him, so it is a standoff between Japanese thugs and Japanese government officials. DM tells the official to just stop. This is a trap, maybe we will all die. DM tells his #1 to protect the kids. Then he tells the Japanese official to just take him. At the same time, someone runs to Heesung and tells him that he should not go a certain way because he heard gunshots. Then Heesung sees DM walking through the streets with the Japanese consulate police people. Heesung stops them and says that they cannot take him without due process (innocent unless proven guilty). DM tells HS that this is not helping him, so he is just leaving. HS yells that he knows someone in the police department so he can tell them. DM tells HS’s servant to stop him from visiting him please (he also apologized for being a stranger). GS and Eugene talk about Dongmae not being a murderer, someone else is the real murderer. The ship leaves for Shanghai in 5 days, so we need to find him before that. He will have a gun wound in his arm so look for all the suspicious people and places that he might be. The soldiers start to look for this person and run into one of the freedom fighters. But they let him leave. Meanwhile, Dongmae is beaten to a pulp while also chained to a chair. They question him about going somewhere to kill the missionary. But Dongmae says he did not kill him, he can give them examples of the people he kills, but you cannot recognize them because they are all chopped up. Someone is let into the room as a witness. It is the maid that used to work at Glory Hotel. Cut to HN talking to a soldier who is also an informant. HN asks him who the witness is and brings up the gold she gave him. But he is hesitant to say. He does tell her who it is at the end. HN goes inside and talks to the woman that stays with DM. She is concerned about DM, but HN tells her that she does not need to know, just know that there is a gun under the pillow, use it when you need it. Don’t be burdened by DM. WI and the Japanese consulate talk about how DM’s men are not loyal to Japan, they are loyal to Dongmae. They want to reform the gangster to their way because they are not Joseon and are not Japan. It is a weak point. The consulate says that he hates DM, but why does WI hate DM? Flashback to DM helping Hee-na get home when she was drunk. WI saw it. Meanwhile, the former maid identifies Dongmae as the person that she saw that day. An American comes in as well, they ask her if he met DM. This girl says that it was a different one. The American he met was a missionary, she saw him take the missionary. The American says that he never met Dongmae before (he speaks Japanese). But in a flashback, we see that he did meet Dongmae in a one on one meeting. Dongmae laughs and says that he does not know why he is the one being trapped. Back at the Japanese consulate meeting, the consulate talks to WI about the letter. With that letter they can take down everyone and make WI the foreign minister, it will be good for everyone. In the interview/torture room, the soldiers are still trying to get Dongmae to say names. But Dongmae is not saying any names and says that he will make sure that they are all dead if he gets out of that place. No one will be able to identify their bodies because he will slice off their heads. But they tell him that the name he should say is Ko Ha-hong. It looks like they are trying to trap Ko Sa-hong which is Aeshin’s grandfather. The man says that they will kill one of his men every day until he says that name. Eugene meets with Hee-na to find out where the letters are from one of the rooms. She says that she burned them. But he says that she is lying. She tells him that in her hotel they always keep the customer’s belongings. Eugene asks for the price to get the letters. She says that it will be useful to save Dongmae so she will ask him later. She tells him she will give him the letters. Eugene tells her that he decided to be tricked, so if you are tricking me now, then I will be tricked. She tells him that she is just saying it because she is WI’s daughter, it is useful now. She walks away. Eugene gets all the letters which also show a map. One piece of the map is missing though. Eugene sees the names on the postage, and all of them are names of missionaries from the bible. All the pilgrims were in Hongyam. Eugene sets off and asks IS and CS to find out everything about Joseph in Hangyam. He will pay him anything. They are moved by the amount of money. Eugene tells them to telegram him if they get anything. He leaves, but then is overcome with the weight of the situation and pauses a moment as the people walk around him. VO – I don’t know if you heard it, but I guess if you heard it, you worry about me. I won’t do anything to make you worry, so don’t worry about me for a while. As you always do, be pretty. Elsewhere, Aeshin passes by the hotel and sees the windmill. VO – The changing names, shaking hands and hugging. Next is missing. Just in case you pass by because it is market day, sometimes I stand on the balcony for a long time (just to see you). I miss you. You are always a fast learner, so I guess you already learned this word. Aeshin – We missed each other. Aeshin puts gloves in the secret container and closes it. Jung Moon confirms to the King that the dead person is the missionary. So it has happened again, they have the letter. The King wonders what he can do, nothing? Jung Moon tells him that what they want is for Joseon to collapse like that. The King says he always moves backward, but WI is running like water with a broken dam. In the palace, WI reads the secret letter about borrowing money from the U.S.A. he tells him that this is a letter from the dead American. He tells them that he told the Japanese people that this is not a true letter, don’t talk about nonsense, it is fake right? If it is real, then it will hurt our relationship with Japan. Flashback to the King meeting with Joseph. Joseph tells the King that God will not let one country crush another country and takes the letter. In the present, WI tells him that Joseon would not do anything. Did the American missionary take your stamp and do it? The King says that the letter is fake (reluctantly). WI bows and tells him that he can appoint him as the foreign minister later, but this is more important right? He bows again as if showing great respect. Cut to DM who is still a bloody mess. He looks up and sees HN smiling in front of him. A table is also in front of him. She tells him that she can not be there too long. He thinks he must be in front of a hallucination. DM does not know who would make him like this. HN tells him that he can just assume it is WI. Then she fills him in on what Eugene is doing and how he had a deep relationship with that missionary. She mentions that he will probably have more torture tomorrow. They will do an autopsy so it will not be favorable to you because the autopsy doctor is WI’s doctor. The scene changes to Eugene talking to the autopsy doctor. The doctor tells him something like it was not from a person who can use a gun well. But Eugene has another opinion. One shot to the leg so he collapses and then they get closer and do one shot in the chest to make it a clear shot because the murderer had an arm wound. The Japanese doctor asks him how he knows. Eugene says it is because he shot him and the doctor treated him. (they are speaking in Japanese). Eugene tells him to write a different autopsy report otherwise he will kill him. Do not touch his body and just wait, he should not be buried anywhere. Meanwhile, Hee-sung walks the street thinking about Go Sa-hong asking him to protect his daughter because he might not have much time. He gets to his house and sees the assassin in front of someone’s home. HS kind of recognizes him and asks him why he is there. I think we know each other from Glory Hotel. But the man runs away and says it is the wrong person. HS runs after him but is stopped by a woman. This is a woman from gambling, she is super strong and keeps him from chasing after that man. Eugene rests in his office after a tiring day. But then GS comes in and reads a letter. The Joseon police proved that an American faked an emperors stamp and tried to take advantage. They are going to execute the murderer and will close the investigation. Eugene gets up in a rage and goes to Jung Moon’s house to talk to him about it. Jung Moon basically says this is a Joseon problem, DM is going to be prosecuted. But Eugene tells him that the day Joseph came to see him, the emperor went out. That is why Joseph could not wait for him. The same day that happened is the day that the emperor left his palace. Joseph would only do that to meet the emperor. He should not be disgraced like this. He tells them that the American consulate will take Dongmae until Josephs honor is restored. Try and stop me. Eugene goes to Kyle’s room and tells him that he needs his help, it could be challenging. Kyle tells him that it sounds like the 3rd sentence of his poem. Cut to Kyle talking to an American diplomat (the one that got paid off). He does not care about the missionary that died. Kyle tells him that he had two choices, he will sign the document or become a better shot than he is. A document is put in front of Dongmae for him to sign. But everyone is scared of releasing him to sign it. But DM is basically like, you will all die if I am released. Eugene walks in super dramatically with his soldiers and takes Dongmae with him to another interview. Eugene asks him about what happened and depending on what he says, he could make him the murderer. EC wants to know why DM searched the assassin’s room. DM says that someone told him that the assassin was asking around as to SH’s house. But everyone knows where he lives, so I was suspicious. Eugene asks who gave him that information, was there an informer? DM tells him that several hideout places are not searchable. Eugene wants to know where he is. DM tells him to find the assassin quickly otherwise his kids with just kill the assassin. But Eugene thinks that DM will be in more trouble. But DM says that will not kill the assassin, they will most likely kill Eugene. I am okay if you die, the American soldiers will guard the door so don’t do anything stupid. Meanwhile, WI is alarmed at what happened with DM. The husband tells him that Eugene took him. WI remembers Aeshin’s mother’s name. She told him that he will get found out even if it takes a long time, he will get found and killed. WI thinks he made a mistake, from now on, listen to me. DM and the American guy, find their weak point. Whether it is women or dog or whatever and release the gangsters and tells them the way that they can save their boss. Eugene shows up at Aeshin’s house and greets him as Captain Eugene Choi. He is patrolling around SH’s house because the assassin is looking around there. He is a Joseon person. Grandfather wants to know why an American wants to protect his home. Eugene tells him it is because Joseon won’t protect him. Grandfather knows what this means, but rather than an American guarding him, he will think about why Joseon won’t protect him. Please take your soldiers from my house and leave. Eugene understands and apologizes. He tells him to increase his guards. The maid tells Aeshin that Eugene came. Joseon will not protect you, so he wanted to protect your house, but they are already kicked out! Aeshin takes off running to her gate, but she stops before crossing it. Outside, Eugene is also riding his horse away as the soldiers march behind him. But he stops. It is as if they each sense the other’s presence. Eugene continues trotting along and walks right past Aeshin, he is able to see her from his side of the gate. He kind of gives her an awkward hello, but that also shows her that he is wearing the gloves that she gave him. She nods tearfully. Eugene gets back to his office. The little boy tells him that he knows someone in the picture. A man came here and put vases in the room two hours ago. Eugene quickly checks his drawer and sees that the letters are gone. Cut to the potter, he has the letters now. There is another man there as well who is one of the four in the picture. He tells them that it will take no time for him to realize what is going on in Hamgyun. Montage of all the freedom fighters that are going about their regular daily activities. The potter and the freedom fighter are talking to Jung Moon. Jung Moon tells them that Eugene is figuring out/threatening their freedom fighting mission. No one is happy about this. Jung Moon mentions that Eugene has an old grudge against Joseon. He chose not to do what the King told him to do. He does not work for Joseon at all. The King’s money went to another person to buy weapons. Before the American can investigate further, kill him. Cut to Eugene walking and talking about all the places where the freedom fighters are. He turns a corner and sees all the Japanese thugs. They pull their swords and want to kill him. Eugene pulls his gun. HS shows up all of a sudden and tells them to stop. Eugene is all like, why are you here? HS approaches one of the thugs and tells him that he is DM’s friend, just go away and drink. He offers them money, but they slice his wallet. HS runs to hide behind Eugene. The fight starts. Surprisingly, HS is not that bad though he is not that great either. They are able to hold off the thugs until the #1 shows up and makes the other thugs stop. #1 apologizes to Eugene and says that the kids just want to help DM, please save our boss. HS tells him, if he does not save your boss then you can kill him then. Eugene looks so annoyed. Later on, Eugene treats HS’s injuries in a very bromantic moment. HS asks him if he is going to come back after finding the assassin. The geisha people said you are looking for him. Did that guy stay in Glory? I suspect someone. Eugene pulls out his picture and asks if it is someone in the picture. HS points to the right guy and says it was him and he smelled funny. Eugene wants to know if it was opioid? HS says it wasn’t it was more like a perfume smell. Eugene thinks that the man might add a lot of perfume to not smell like opioid. Perhaps he lives in a shaman house? (Because they have incense burning all the time). Scene change to a shaman house. The assassin is eating there. The shaman tells her that people are looking for him. He throws her some more money. She smiles and tells him that he is rich, he should leave there. But he says that he wants to tell his longtime best friends daughter who killed her parents. The shaman thinks he is a good person, eat more. Meanwhile, Aeshin meets with the hunter. He asks why she called him. She tells him that he should take her out. He wants to know if she is going to see him? How far out have you been? She tells him that she went all the way to the sea, now she wants to go further. That time is now. That place that is further than the sea. I will accept all of your worry and yelling, but I will go to see him. Please do not ask me anything, teacher, just say yes. The hunter looks at her for a moment and then tells her yes, please hurry it is almost time for curfew. Eugene gets to his room and senses someone inside. He quickly finds them and pins them against the door, but it is actually Aeshin. He quickly lets her go and apologizes as she coughs and says that he thought someone snuck in again. She tells him that actually….she snuck in. She is there to ask him questions and is dressed in her male clothing again. He says that she saw that he missed her – from his letter. She also missed him, too. Aeshin – That day that I saw you, I saw you, but I could not stop. I am sorry. Eugene – No, it was a good choice. Aeshin – I wanted to comfort you. Eugene – You already did, this is more than enough. Aeshin walks closer to him. She touches his cheek softly. He starts to tear up. Aeshin – You gracious and great guy, my son, wherever you are, I will pray for you. The night I don’t pray, God will be with you. He holds her hand to his cheek and tries not to cry. She tells him that she translated the letter with all her effort to pray for him and comfort him. But then a bullet shoots through the window. They both quickly jump behind something. She tells him not to worry about her if anyone finds out then it will be big news. He thinks he needs to go to the roof. They both think the hotel will be in chaos because of the gun sound. There is a knock on the door. HN – I heard a gunshot, what is going on? AS answers and asks her to take her to the back door, she needs to sneak out. HN says that a handsome man is asking her. HN – You are bleeding from your nose, cover your face (with a handkerchief). Aeshin takes one last look at Eugene then covers her face and leaves with HN. Downstairs, everyone is alarmed at the gun sign. HN tells them all that it is being addressed, please sit for coffee. She nods at Aeshin. But then a Japanese man holds a gun to her head and asks HN if she is doing this to sneak out a woman? (perhaps the deaf woman that is hiding). Outside, Eugene notices a man hoping over the rooftop and shoots him. The man falls to the ground with an injured leg, it is one of the four freedom fighters. Eugene catches up to him and unmasks him. Inside the hotel, The deaf woman is hiding, HN is walking at gunpoint, but she sees her sword and grabs it quickly. She disarms the man, and Aeshin pulls he gun on him. Then Aeshin grabs a vase to hit him with. HN tells her it is a cheap one, so Aeshin goes ahead and hits him with it. He falls to the ground unconscious. Meanwhile, Eugene has taken the man to an interview room to question him about the photo. The man wants to know why he has this picture. Eugene wants to know why he wants to kill him. The man says that his investigation is too close to the truth and threatens their cause. That is why we decided to kill you. Elsewhere, Aeshin shows up at the pharmacy, but the river woman is there to see her. She tells her that the commander wants to meet with her, don’t change your clothing. Eugene asks the man if the potter really asks him to kill him. The man says it is for the bigger picture, let me you a favor – I am asking for my dead friend. Don’t be close to AS anymore. She will be in danger because of it, maybe she is already in jeopardy. I am the one that tried to kill you today, but it could be Aeshin tomorrow. (She might try to kill him). Eugene tells him not to worry, it will work because he will not run away. Maybe it can be today. I am going to see the potter today. He gets up to leave, the man tells him not to do anything stupid, just catch the assassin. But EC says that he already caught him. Aeshin meets the potter, the potter says that he needs her help. She tells him that he never asked her why she bought the broken pots. I thought you were our comrade because SG sent me here to buy the broken bowls, but are you the commander? Potter – Are you surprised because a normal class person is the commander? EC also shows up to the river with his rifle. The restaurant ajumma fires an arrow to alert the potter. The potter tells Aeshin that he sent someone to assassinate Eugene, but they failed. Someone is crossing the river, whoever that person is, kill him. Aeshin – Who? Is the person crossing the river, that American? He is moving due to his goodwill, but his goodwill will put Joseon in danger. Whoever that guy is, Just kill that person whether he is your sailor or not. Eugene walks across the frozen river assuredly as the snow falls around him. Loved the ending! Who thinks she is going to shoot him? This post was very quickly proofread by Grammarly. I have a feeling AS master will intervine. He will not allow any shooting…or AS wont shoot….thats my theory…. There is no preview, will there be no episodes next week? I noticed some shows doesnt have previews too, they said its because of Asian Games. Is that true? It’s true, I heard that “Your Honor” and “30 but 17” won’t air this week. There might have been a preview! I’m waiting for still 17. Is the post coming soon? Hi Shayri, there was no episode yesterday. Only one episode this week which airs today (due to the Asia games). …as always thanks for the quick recap! It was Dong-Mae’s show all the way! This guys is such badass. YYS nailed it this episode. He has been growing on me. This is a random question, i just looked at this post’s photo again, and the items on the far left center caught my eye. They somehow look too “modern” to be available in Korea at the time, Haha! What year was this drama supposed to take place in again? Are those just normal items to have for Yangbans at the time? 😀 Just curious. OMG, lol! I think that was a complete accident! Not just the plastic, but the red and green on it and the shape make it look so modern. Plus the box and the Wellies? I think someone accidentally left their stuff there.